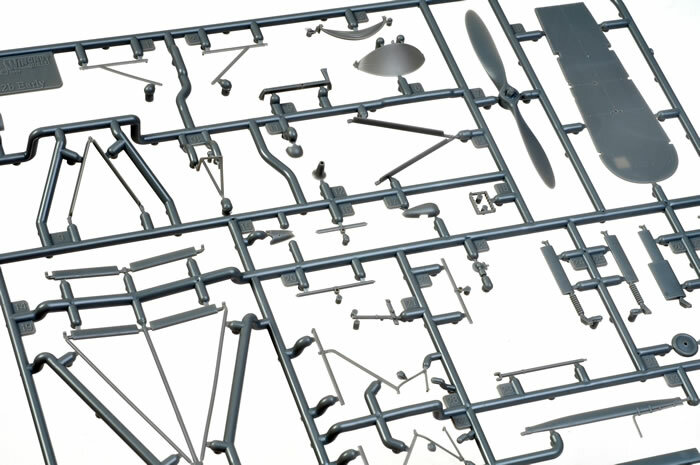 343 parts in grey injection moulded plastic; seven parts in clear; 12 photo-etched parts; markings for five camouflaged aircraft. USD$89.00 with free shipping worldwide, available online from Wingnut Wings' website. Accurate representation; outstanding detail; cleverly engineered for ease of assembly, , crisp clean mouldings, comprehensive decal sheet in perfect register with minimal carrier film, photo-etched seat belts and a mini “Datafile” for an instruction booklet. Wingnut Wings has tackled another iconic British two-seater and it’s their most ambitious one to date. They have risen to the occasion admirably and produced a kit that is not only buildable but doesn’t compromise on accuracy to do so. The FE2b was not a glamorous aircraft. This and the fact that it’s a “lattice tail” has scared most kit manufacturers away from the subject. That is sad because this WWI “workhorse” operated in a number of significant roles and could be seen serving as a fighter/reconnaissance aircraft, night bomber or even a trainer. As a result, the various incarnations were in production for nearly the entire period from early 1915 to the Armistice. Now finally a new kit has appeared of this important aircraft and fittingly it’s from the “Land of the Long White Cloud”. 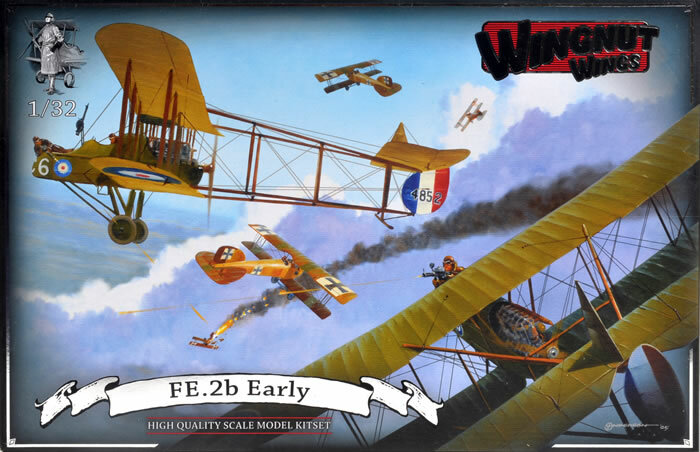 This is one of the most ambitious releases yet from Wingnut Wings. The size and complexity of the subject ensures that the contents fill the large sized box to the brim. 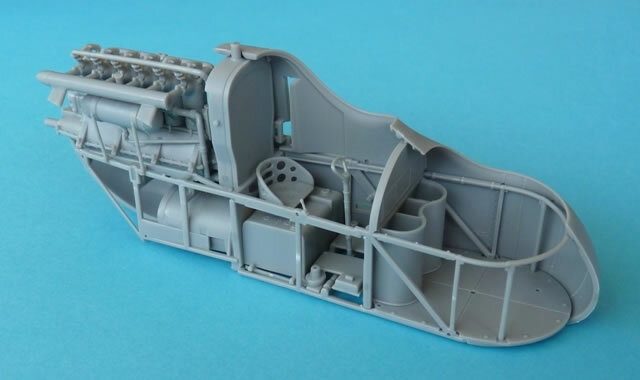 Inside we find 11 sprues of plastic, one of which is clear to provide for the windscreen, camera lens and Holt landing lights. 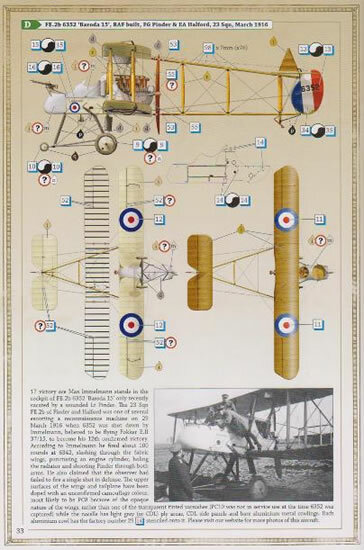 These are supplemented by a fret of photo etched parts and a couple of decal sheets that allow you to choose between 5 interesting aircraft. The “Fee” was a complex beast and the high number of parts reflects it. There are 362 in total although 10 percent can be confined to the “spares” box. The assembly sequence is logical and it’s a credit to the designers that everything goes together so well. No need for headache tablets here. 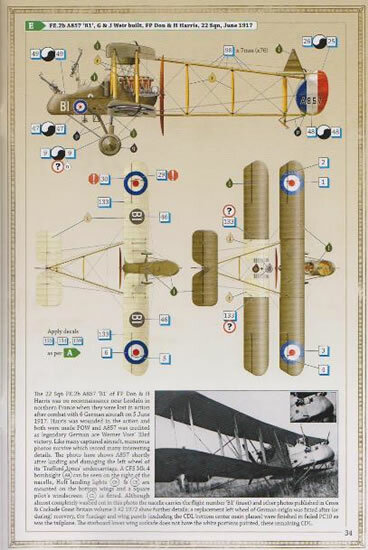 The new parts, marking schemes and decals are shown in this review. 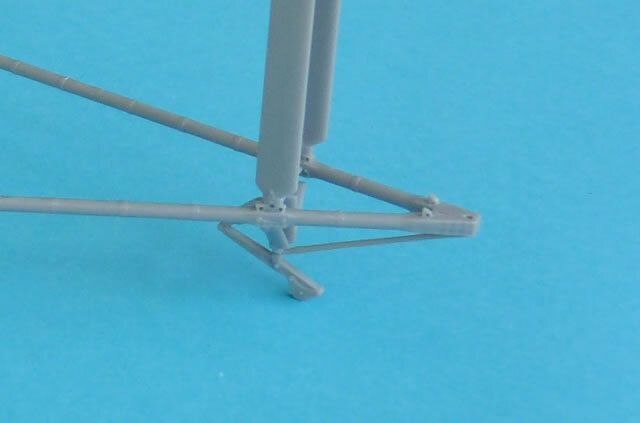 For detailed photos of the other sprues, see Brett Green's review of the late version FE.2b. Fittingly enough, construction starts with the nacelle interior and the modeller must immediately decide which version to build. These choices are one of the hallmarks of the kit as the large number of alternate parts ensures both accuracy and variety of subject matter. 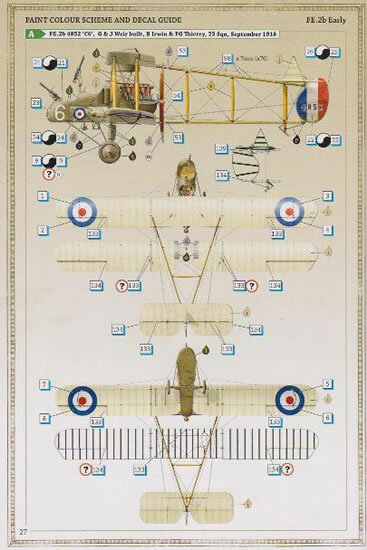 Depending on the aircraft chosen, decisions have to be made regarding the pilot’s locker, 18 gal fuel tank, ammunition storage, instrument panel layout (RAF Mk.II compass or map board with pattern 5/17 compass), Stirling wireless set, and Lewis gun mounts. Lap belts for the pilot and observer/gunner are supplied and these come courtesy of the aforementioned photo etched fret. Over 40 parts can make up this area which is very comprehensive indeed. Accuracy is not a problem as comparison to period photos and “The Vintage Aviator LTD”’s reproduction Fe2b confirm the arrangements. The engineering of the kit ensures that any ejection pin marks are essentially hidden on the completed model. Note that these are not to be confused with the large circular depressions found inside the engine compartment of the two nacelle halves. They correspond to external access hatches needed to service the engine so be sure not to fill them! Instrument faces are courtesy of well printed decals and any excess carrier film should be trimmed to obtain a perfect fit. The interior and surrounding structure fit perfectly inside the nacelle halves which allow you to move confidently on to the power plant. A choice of 120hp and 160hp Beardmore engines is catered for (with 2 or 4 bladed props) and expectantly 4 of the 5 options utilize the former variety. Due to its exposure to prying eyes, this area needs to show off a lot of detail and WNW does not disappoint. There can be as many as 36 parts contributing to this assembly when one includes the lovely 3 gal oil tank. The instruction book provides plenty of close-up photographs and is a real boon for “super detailers”. As we have come to expect from this manufacturer, the 32 pages also doubles as a great source of reference material with plenty of images from all parts of the airframe. The wings on the “Fee” are huge. As per the original, the upper item is in three pieces. The large tabs connecting the outer wings slot positively into the centre section thus ensuring a strong join at the correct angle. 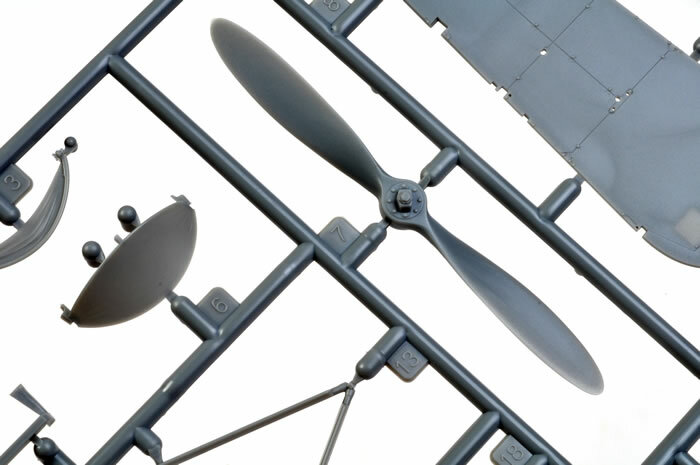 To make sure there is sufficient strength, the lower ones have been moulded in one piece and once again the large locating tabs guarantee that an accurate dihedral is maintained. All of the flying surfaces have sharp trailing edges and present a subtle representation of the stitching through the rib tapes. A choice of undercarriage keeps everything off the ground and here we choose between the “tricycle” oleo version and the Trafford Jones modified alternative. 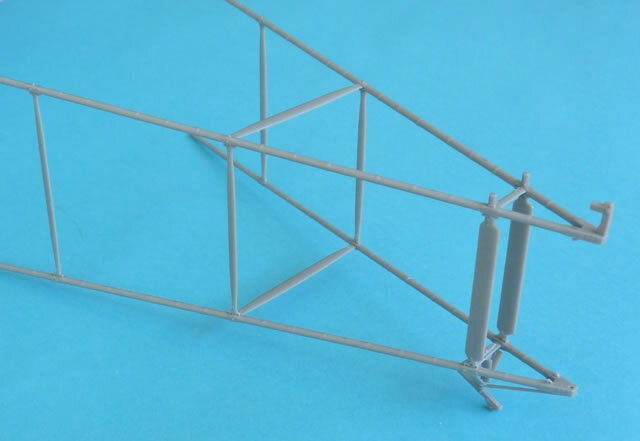 The thought of modelling a “lattice tail” would usually strike fear into any WWI modeller. Fortunately that need not be the case here thanks to the precise engineering standards set by this kit. The complete tail can be assembled separately and then added to the wings via positive locating slots. Rigging will be a challenge as one has to be careful not to distort the structure with over tensioning. Many will have their own trusted method but for those not confident in this area, WNW provides a foolproof solution with their EZ-line elastic rigging material. Diagrams in the instruction booklet show where every wire should go and in combination with the pre-drilled location holes, nothing is left to the imagination. 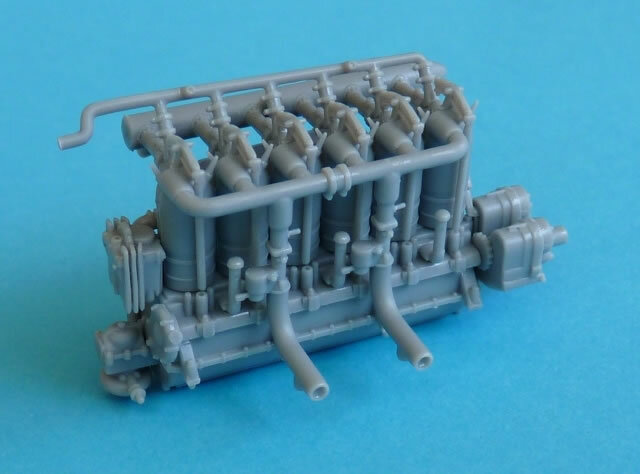 The RFC armament sprue is a real bonus and depending on which aircraft you select, there will be quite a few items left over for future projects. Bombs come in three flavours and the modeller has at their disposal the 20lb HALE or 110lb/112lb HERL varieties. They all come with their associated carriers and WNW makes sure you don’t forget the release levers or the CFS Mk.4 bombsight. Mk.I and Mk.II Lewis guns also make an appearance with the former coming in standard and stripped states. Both 47 and 97 round magazines are supplied as well as the appropriate collector bags. Rounding it all out is a Thornton-Pickard Type C camera, makeshift 20 Sqn mount and even a Klaxon horn! 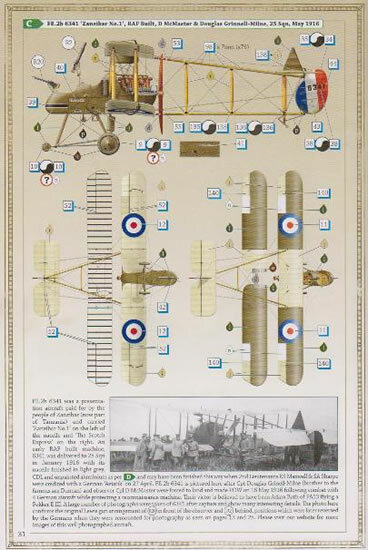 The generous decal sheets cater for five options, all of which are printed in perfect register and are surrounded by a minimum of carrier film. They are very thin and the colour density is excellent. Decal setting solutions can be used safely but it is wise to stay away from the stronger solutions. Apart from the usual roundels and individual markings, there is also a wealth of other data included. 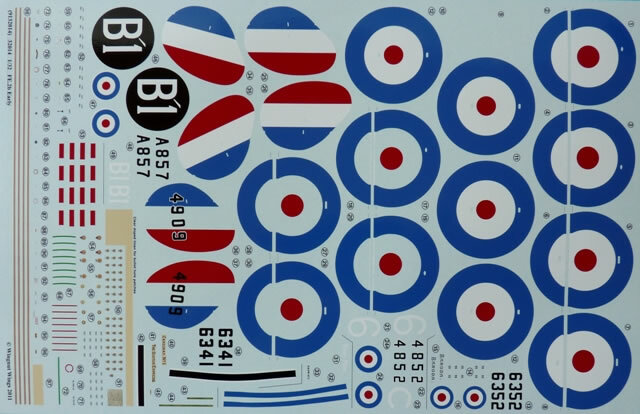 Stenciling (including bits and pieces for the ordinance), instrument faces, logos, clipboard map and even clear doped linen swatches for bullet hole patches. This well worn aircraft was forced down by Martin Zander on 17 September 1917 while on a reconnaissance mission. It was the Jasta 1 commander’s 4th victory of a total of 5. The crew was reported to have died in the action despite the relative intact nature of the aircraft. This is the aircraft that Max Immelmann was attacking when he appeared to shoot off his own propeller due to a failure in the gun synchronizing mechanism. He lost his life in the action, as did Savage in the FE2b. 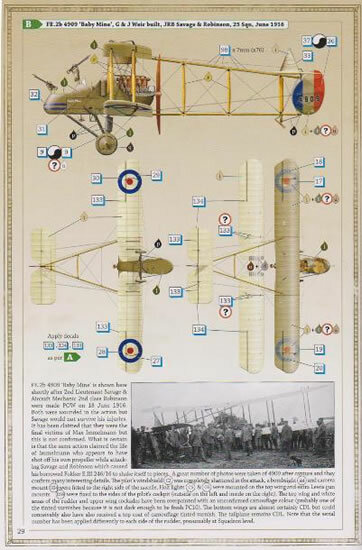 Robinson survived and was made a POW on 18 June 1916. As the name suggests, this was a presentation aircraft from the people of Zanzibar. Printed on the starboard side was “The Scotch Express” which adds further interest to the machine. While flying as protection for a reconnaissance mission, the crew was forced down by a Fokker E.III believed to have been flown by Adam Barth of FA13 on 16 May 1916. This is another of Max Immelmann’s conquests and became the 12th of his 17 victories on 29 March 1916. Immelmann himself stated that he fired approximately 100 rounds into the machine which resulted in holing the radiator and an engine cylinder as well as wounding Pinder in both arms. On 5th June 1917, Don and Harris were on a reconnaissance mission when the crew had the misfortune of running into Werner Voss. As a result they were to become his 33rd victory. Both survived to become POWs. British two-seaters are fascinating subjects and the FE2b is no exception. It’s a multifaceted aircraft and its ungainly appearance gives it a certain charm. With this release, Wingnut Wings have captured that look perfectly. Thanks to some clever engineering, assembly is not the challenge you would expect and this is not done at the expense of detail. The subtle rendition of wrinkled fabric on the nacelle is a nice touch and the large number of alternate parts allows an accurate portrayal of whichever subject you choose. It’s an amazing package that allows the modeller to build a quality 1:32 scale example of this iconic “pusher”.